All for one and one for all to the other side! Mud Masters means teamwork. You’re going to prove that you and your buddy are real team players during the Buddy Carry! The assignment is very simple: Bring each other to the other side. 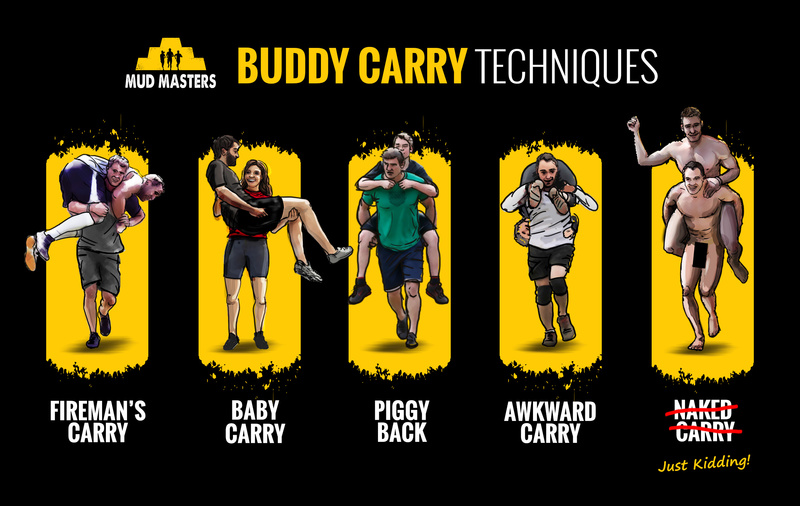 On the first half of the course, one buddy is carried by the other one; then you switch positions. There is no better test for your friendship or family ties. Will you really be supported by the other? 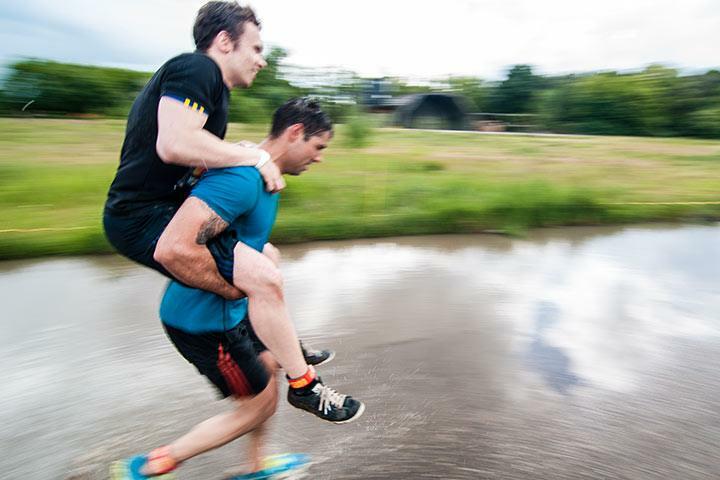 The heaviest participant carried at Mud Masters weighed 142 kg. His carrier weighed almost half as much: 74 kg. Talk about teamwork and perseverance! Which technique will you and your buddy use next time? After getting through a Buddy Carry with your colleague, there’ll be no more uncomfortable discussions at the coffee machine. 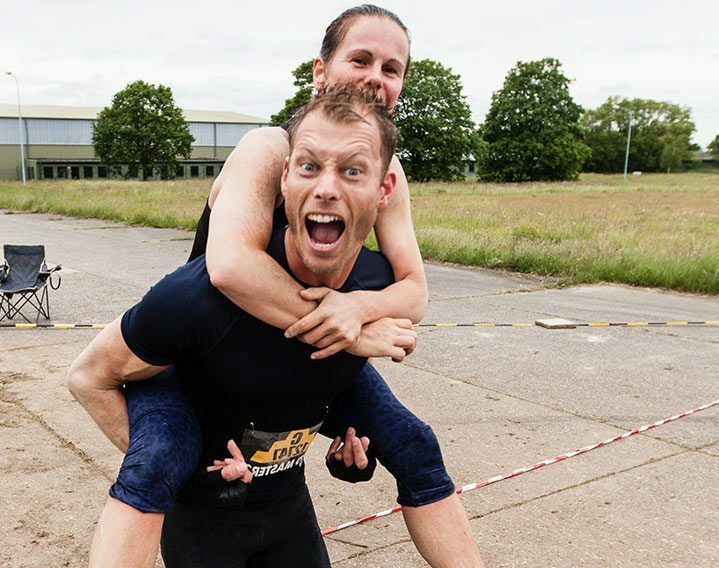 Register your company now for the next Mud Masters challenge! Just leave your car at home when you’re out on the town and carry your drunken buddy home using one of these techniques. Do you also want to train for the other obstacles? On our preparation page you’ll find trainers and clubs near you! This obstacle is inspired by the buddy system at the Marine Corps. Marines work together closely and take care of each other, which produces a synergy. So, 1+1=3. Military personnel and also fire fighters use this exercise to learn how to carry their wounded buddies or victims to a safe place. The requirement of the Royal Marines is that together you cover 200 meters in 90 seconds, with 15 kilograms of equipment and weapons per person. We started on the run as friends, but after the Buddy Carry we feel like we’re brothers for life!